By Jim Herbert, PE, Barr Engineering Co. Owned and operated by Capitol Region Watershed District (CRWD), the Trout Brook interceptor (TBI) is a system of storm sewers in the east metro that discharges into the Mississippi River. 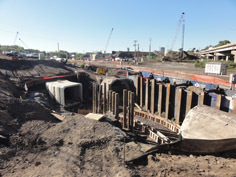 In 2011, the Minnesota Department of Transportation (MnDOT) informed CRWD that new footings associated with I-35E interchange bridges near downtown St. Paul would interfere with the existing alignment of the 100-year-old storm sewer. Numerous options -- including straddling MnDOT bridge piers -- were initially considered to relocate the TBI around the bridge footings and rejected because they were not in CRWD’s best interest for long-term management and maintenance of the system, or were not cost effective based on MnDOT’s review. Ultimately, MnDOT and CRWD agreed on a hydraulically-efficient realignment that met the objectives of both organizations. CRWD hired Barr to assist with design, coordination, and preparation of bidding documents for the fast-track project. The construction cost of the two-phase project was $3.3 million. For Phase 1 of the project constructed during 2012, the BNSF Railway agreed to a rare 30-hour shutdown of two mainline and one service line railroad tracks to allow removal and replacement of 120 feet of railroad track, installation of 162 feet of 12 foot by 9 foot box culvert by open-cut excavation, and backfilling. CRWD and its contractor were provided 24 of those hours for the box culvert installation. BNSF was responsible for track removal and replacement during the balance of the work window. However, a high groundwater table, contaminated soils and groundwater, the tight work window, and compressible organic soils beneath the tracks added layers of complexity to the project. Prior to construction, the excavation needed to be completely dewatered, requiring permits for disposing of contaminated groundwater and impacted soils and the design of a sophisticated track-monitoring system to verify that dewatering did not affect the surrounding railway. Barr used an innovative monitoring system consisting of automated robotic total stations (AMTS) installed at either end of the site and over 250 prisms placed on the tracks to provide near real-time, web-based monitoring during project dewatering and construction. A series of alarm triggers were also developed based on allowable movements to prevent a derailment. The 30-hour construction window presented several other challenges as well. The project timeframe prevented contaminated soils from being remediated on site. Instead, the soil was removed to a nearby staging area, for later screening and disposal, and replaced with clean off-site pit-run soil. During the excavation, a seven-foot stone-arch tunnel predating the TBI was also discovered beneath tracks. The project team and BNSF Railway chose to have the tunnel plugged and capped to allow BNSF to address the remainder of the tunnel at a future date. 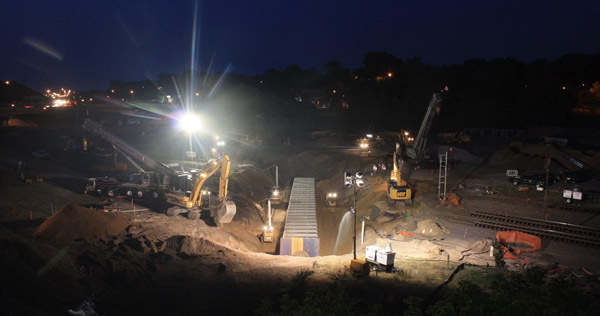 Construction during the 30-hour work window was successfully completed and rail service restored, minimizing railway disruptions and enabling MnDOT’s highway project to move forward. Pumped the base flow of the storm-sewer interceptor around the work site. Provided a bypass for flows up to 150 cubic feet per second. aAlowed larger storm flows to go through the excavation. Cast-in-place tunnel sections connected the new 760-foot segment with the existing Trout Brook storm-sewer interceptor. Once completed, the old storm sewer segment was demolished or abandoned using sand and concrete. An automated rail monitoring and alarm system. Environmental investigations and cleanup planning. Final design, plans, and specifications. For more information about this project or Barr Engineering Co., please contact Jim Herbert, Vice President, at (952) 832-2784 or jherbert@barr.com.